Arlington, Virginia-based government services contractor CACI International (NYSE: CACI) narrowed revenue forecasts for its 2016 fiscal year on delays to contract awards as some bookings arrived late in its third fiscal quarter that ended in March, CEO Ken Asbury told investors Thursday. As GovCon Wire reported Wednesday, CACI cut the high end of its 2016 fiscal year revenue outlook to $3.8 billion from $3.9 billion with the lower part unchanged at $3.7 billion, while third quarter sales totaled $977.27 million versus analyst expectations of $1.01 billion. The National Security Solutions business acquired in February contributed $171.9 million to overall revenue and NSS sales led CACI to hold the lower end of its full-year guidance as is, Asbury said in that call to discuss third quarter results. 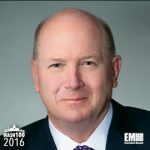 “Government spending activity was down in January and February… we’re seeing the start of the fourth quarter with a healthy flow of award activity, ” the 2016 Wash100 inductee said. As of 12:30 p.m. Eastern time, CACI’s shares had declined 8.45 percent and in mid-morning trade were down as much as 11.55 percent.